Trapped in hell for a while, Freddy Krueger meets up with Jason Voorhees after Jason is sent to hell by Creighton Duke (forget part X; rewind to Friday the 13th Part IX). Krueger is able to disguise himself as Pamela Voorhees, and instructs Jason to start murdering on Elm Street upon his resurrection, therefore restoring Freddy's power as well. Jason does this task, drawing the attention of Tommy Jarvis, the only person to have single-handedly defeated Jason twice, and Alice, who has managed to defeat Freddy twice as well. 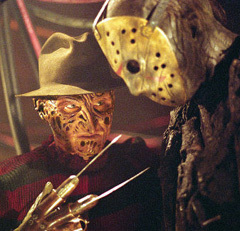 However, once Jason realizes what Freddy has done, he is infuriated. Hellbent on vengence, Jason renews his bloodbath in pursuit of personally slaughtering Krueger, and anyone else in his path. The expression 'flogging a dead horse' comes to mind. But that's probably in the movie too. "You think this is hell? Wait till you sit through the movie. Then there's Jason vs Freddy, Jason & Freddy vs The world and,, well you get the picture"